An OLPC XO "Trojan horse" gift? In most states (the United States is not one of them), most states control the textbooks, use the textbook channel. The Federal channel in Brazil does the textbooks. You may think of that as a liability but we use it as a feature, distribute through that channel, and it's a Trojan horse approach. It appears gently as a textbook and then at night the kids come out and use it as a laptop. That's the Trojan horse approach with sort of a book story as we've thought about it. This is in some ways a Trojan Horse. Governments are buying into this because this looks like a terrific way of creating a computer savvy workforce, fighting brain drain, essentially bursting into the 21st century. But what it also is is a backdoor into overhauling the entire education system of a lot of the countries that we are talking about. While both analogies may be true, and both men use the Trojan hose analogy in a positive way, I would advise great caution in using the term too widely or too loosely, especially in the cultural context of One Laptop Per Child. The original Trojan horse idea comes from Greek mythology and symbolizes a seeming benign gift than then allows the giver to defeat the gift recipient. In computing, a Trojan horse is a malicious program masquerading as helpful software, while really collecting exploiting, falsifying, or destroying data. Neither context sounds appropriate for a new technology developed in the USA, built in China, and sold to developing countries as a multi-million dollar cure-all for primary education. After being burned by too many white elephants in the past, OLPC's target governments are already wary of promises for progress if they buy the newest shiny, flashy gizmo from America. Then, in current geopolitics, the USA is sometimes seen as a bully, invader, kidnapper, or spy, especially by small, or poor, or politically weak countries. I would note that another way of explaining the ideas behind my recent posts on one-to-one laptop initiatives and IT infrastructure in general (here and here) is to point out that this is essentially the "Trojan Horse" strategy devised by OLPC, applied to US schools. You find very conventionally convincing ways to almost completely offset the cost of hardware and software (which you keep quite low) as a way to get your (subversive) technology into schools and keep it there. So OLPC leadership, for the sake of One Laptop Per Child, for the sake of needy students, for the sake everyone involved, before the meme gets too far along, drop the OLPC Trojan horse comparison. This statement could easily be misunderstood and might cause more confusion than clarity. And OLPC could use some more clarity, indeed. Unfortunately this statement is another one in a long row that confirms Prof. Negroponte's tragic tendency to unintentionally be himself one of the worst adversaries of OLPC and the needy kids. customers. And they spend hours talking about it in public? What the hell? How is THAT supposed to work? If you really would like to optimize the trojan horse game you simply tell the countries only about the e-book-application and how saving money on paper books pays for the laptops. Further you tell them that curricula and content remains their business. The only thing they have to do is digitize their books and distribute the XOs, that's it. No teacher training is necessary since everything remains as it was before. The mesh network is for easy distribution of the e-book-files and the the few collaborative games in the software are for spare time use only. The politicians are happy and buy a few hundred thousand of them. When they are installed in the beginning everything goes as planned. Only once the kids have internet access the governments loose control over the internet access. Having a mesh network it is no use the governments block the big internet exit because very few, very simple internet links anywhere inside the mesh network like a few GPRS-handies, sat-handies or a single satellite dish in a tree can provide tenthousands of kids access over the mesh. Maybe the highly optimized radio antennas of the XO have enough gain to directly receive satellite broadcasts like sat-handies. Cutting the power won't stop it since they have their power cords. Even radio jamming could stop the mesh network only locally. Again, once this mesh network is in place the governments have already lost their control over it. Now you can feed the kids whatever content you like or to say it more precisely whatever content is attractive for the kids. And given the dull teaching material in their schools that is an easy game. So now you can not only apply playful teaching methods to better educate the kids without the goverment's consent but you also can mix social values and political content of your liking into those games. You can start to slowly influence public opinion of a young generation maybe even the parents with them. You can influence who they vote for if they are allowed to vote. You could use it to agitate people against their government or to make them accept an occupation by a foreign power as "liberation". Does this sound scary? Is it silly science fiction or could it be possible? No matter your view of the outcome, Roland, your dream will never start if a Ministry is told its buying a "Trojan horse." The phrase has too much negative connotation for those that receive such a described thing. The Trojan Horse metaphor is a clever way to approach the entrance of OLPC into the educational system. Let me explain why. Yesterday I gave a talk about OLPC to the government team in charge of promoting ICT in education. From the bureaucrats’ point of view, the main problem with OLPC (or Classmate PC or any other similar machine) is how to integrate a great number of laptops into de curriculum (all the logistics, training, support, and long-term plans). It represents a huge challenge for them. One that they don’t know –right now- how to deal with. After yesterday’s talk I am 100% positive about this: One of the major barriers that may keep us away from the massive entrance of computers in the schools is located within the offices of the Ministry of Education. My approach to this dilemma follows exactly the same Negropontian metaphor. It is necessary to reduce the uncertainty of the technical and professional staff in charge of dealing with this new technology. If they are forced to integrate OLPC into de curriculum from day 1, I can assure you, it would be catastrophic. You will have panicked bureaucrats and frightened school teachers all over the nation. With the Trojan Horse approach in mind you receive a GIFT from the central government (with thanks to Uncle Negroponte). ONCE INSIDE THE SCHOOL, ONLY GREAT THINGS CAN HAPPEN. It is exactly like the book distribution system or the ‘free food’ programme we already have: kids in all the public system (including all the poor schools of the country) get a couple of free text books and qualifying children get food. OLPC can enter schools in the same way. Yes, it would be great to have integration in the classroom, teacher training and evaluation programmes but, and here is the great question: Are we going to wait a couple of years until the bureaucrats feel comfortable enough to say ‘Ok, bring them now, we are ready’. That’s just simply unfair to the kids. We do have the money to buy 250K XOs right now. Kids shouldn’t wait. ...sorry I forgot: people, you don't have to tell the Ministries of Education that OLPC can work as a Trojan Horse. You shoudn't actually. As wayan says: it is a scary thing to say. Luis, I think that you are ignoring the realities of life: nobody likes to feel cheated. If someone is telling me: get this car, it's great, and suddenly, after the sale, I discover that this is not really a car, but a device that forces me to change my house too, I'm mostly going to feel cheated. And politicians, teachers and the general public are not necessarily going to feel that good knowing they are actively being cheated. There are too many negative connotations from Trojan Horse, as Wayan mentions. After all, all the Trojans got killed! And following Negroponte's stated goals, it appears that the ultimate goal of the XO is to "kill" teachers, to free schools from its teacher-based shackles and, Prometheus like, bring the gift of fire (or computing power) to the masses. If somebody starts to talk about trojan horses and deceiving ministries in order to have them do the right thing can backfire badly and generally does decrease trust. On top of that Nicolas Negroponte's brother John was the boss of all US secret services until January 5th 2007 with cabinet level and directly reporting to the US president. In that capacity he announced 8 mission managers beneath him. One of those missions is "counterproliferation". This "mission" definately has to do with education and taking influence on 3rd-world-countries. So there is a motive or "mission" called "counterproliferation" and there is the ability like decades of experience in intelligence and diplomacy combined with a senior position that has the power to make things happen (he controlled a annual budget of $40 billions including whole spy satellite programs) and a brother Nicolas who has some form of access to those countries' education systems. Knowing this further decreases my trust level. Although it seems like FUD it is better to draw a worst case scenario such that everybody can judge for himself what the potential risks are or not are. Maybe all this is exaggerated. But then again Nicolas Negroponte should not try to use hidden agendas specially if he has good intentions. "With the Trojan Horse approach in mind you receive a GIFT from the central government (with thanks to Uncle Negroponte). ONCE INSIDE THE SCHOOL, ONLY GREAT THINGS CAN HAPPEN. " 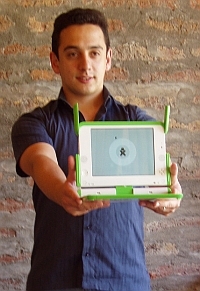 Mr. Ramirez is a member of the Executive Committee for the OLPC Campaign in Chile. He recently introduced the XO machine to mebers of his country's Ministry of Education. He had a few VERY interesting things to say about this presenation in his personal blog. I'll translate. No estoy seguro si me fue bien o mal. Lo que si estoy seguro es que ellos se quedaron con dudas respecto de cómo implementar, cómo integrar en el curriculum, cómo capacitar a los padres y a los profesores, cómo preparar evaluaciones, cómo articular con otros planes de gobierno, etc. I'm not sure if I did well or not. What I do know for sure is that they had doubts on how to implement this program, how to integrate the curriculum, how to train teachers and parents, how to establish an evaluation process, how to synch with other government initiatives, etc. No dudo que todo eso sea necesario, pero lo que intenté relevar en mi presentación es que el proyecto OLPC apunta a dejar que sean los propios niños (y no los profesores o los planes del ministerio) los que se transformen en protagonistas y descubridores. Esta noción, como hemos dicho anteriormente cuando planteaba la pregunta: OLPC: ¿Demasiado innovador para que funcione? desde luego choca con la resistencia al cambio de la burocracia educativa. This idea (as I have mentioned before when posing the question :"OLPC. Too innovative to work? "), of course clashes with the education bureocracy's resistance to change. Lo que sentía de parte de la audiencia es que mis palabras suponían anatema. ¿Y cómo enfrenté ese escenario adverso? I felt my words were anathema to the audience. How did I approach such adverse scenario? Lo que trate de lograr fue enfatizar que en definitiva el tema de llevar estas máquinas a las escuelas no pasaba por NECESARIAMENTE integrarlas a todas las clases y a todos los programas educativos. I tried to emphasize the point that these machinies need not be integrated with all classes and educational programs. No era necesario que eso ocurriese desde el comienzo ( y por tanto era importante disminuir la ansiedad que el ingreso masivo de estas máquinas suponía para los planes del Ministerio). Más bien, lo que sugerí es que se podía intentar un esquema en el que las máquinas llegan a las escuelas para que los niños las usen tal como pueden consultar una enciclopedia: explorarla en su tiempo libre y según sus necesidades. Sin embargo, lo que expresé con más fuerza fue el argumento ético: no puede jusficarse la negativa a masificar estas tecnológicas en un contexto de holgura fiscal basados en que los burócratas no tienen respuestas a las preguntas relacionadas con la implementación. Los niños más pobres del país no tienen culpa de eso. En fin, sólo el tiempo dirá si lo de hoy produce algún resultado. Our country's poor kids have nothing to do with that. Anyway, only time will tell if today's work will produce any results. How do you dare present ANYTHING without answers to the most basic questions ("how am I supposed to use this?") and expect people to be happy or confident? Looking at the natural reaction of Chile's officials shows that the trojan horse strategy is already backfiring as expected. The OLPC leadership thought it could get away without preparing answers for the expectable hard questions. But it does not work. OLPC has already shown that it could do it the right way. For the hardware development there were also hard questions in the beginning. And by putting together a capable team, with good faith, resourcefulness and hard work most of them could be answered. Why don't they take the same approach with the implementation? Team up with the concerned parties and work out the open issues. There will be no way around this. The officials carry the responsability. And if they are worth their salt they won't accept large scale experiments without having answered the hard questions first. Of course that could mean more hard work for one or two years with a corresponding delay. So what? If this is the only way to success then OLPC or everybody else has to take it. By choosing an open and honest way success is much more likely than causing unnecessary suspicion by planning clandestine tactics. "Team up with the concerned parties and work out the open issues. There will be no way around this. The officials carry the responsability. And if they are worth their salt they won't accept large scale experiments without having answered the hard questions first. Of course that could mean more hard work for one or two years with a corresponding delay. So what? If this is the only way to success then OLPC or everybody else has to take it." Besides, it's not like somebody will come along in the meantime. Any other initiative will be required to go through the same process, so odds are OLPC would be the first, even with a 1 or 2 year delay. People here may think I hate Negroponte from my continued opposition to his tactics. They would be surprised to know that I'm actually rooting for the guy to do the right thing and become successful in this endeavour. I think all that is needed at this point is transparency and knowledgeable people spreading the word. Up to now, Negroponte has been represented by sycophants who think that the road to success can be paved with lies and political maneuvering. "Trojan Horse" really is an extremely awkward public malapropism. From the standpoint of IT technology, the XO computers will penetrate an intelectual realm that could otherwise be penetrated by something like the Intel Classmate, with its undesirable seed of addiction to the young minds. The XO Trojan horse will bring freedom to the minds of the children now oppressed by ignorance. This is my interpretation of Negroponte's statement. One thing that amazed me is that Intel are devoting $1B to prevent governements to buy OLPC (AMD) laptops. That is the equivalent to 5 million XOs. I cannot think Intel would do this without being convinced that the OLPC is slated to be a raving success. the article in nature tells that Intel is doing pilot projects in 25 countries. That could be an indication that Intel is acrually doing its homework before rolling out millions of laptops. If they use those pilot projects to identify strengths and weaknesses of the classroom integration and improve it Intel will soon be ahead of OLPC. It is not always the better technology that wins the market but the better overall-solution in marketing speak called the "extended product". Apart from the hardware this includes services like customer training that is increasingly important with complex products. What use was a fancy video recorder when you couldn't find out in one minute how to use it. Now many would agree that OLPC has presently the best HW / SW combination. But when OLPC does not care much to help the customers with the implementation it can still loose the race. Remember the video recorder race at the end of the 70's where JVC's VHS was the inferior technology but won over Grundig's Video2000 and Sony's Betamax because they made their technology more accessible to the customer. "If they use those pilot projects to identify strengths and weaknesses of the classroom integration and improve it Intel will soon be ahead of OLPC." I seriously doubt that. And I would welcome any examples that they actually do that. Intel have done everything to redicule the OLPC. When this didn't work, they introduced the Classmate. This does not signify a real believer. Note that Intel did NOT do a lot of R&D to create a good platform for schools. Nor did they design ANY educational software. They just allow standard XP and Linux on it. Standard XP and Linux were NOT developed for children. Then they allocate $1B to promote the Classmate. That is enough to build and distribute 5 million OLPC laptops. The OLPC could have completed the whole project with that amount of money. And that from a company that is currently in court on the charges that it does EVERYthing they can to prevent AMD from selling chips. This is all just unhealthy competition, and it might have benefitted the children. What I would find really unforgivable, would be if Intel was willing to distribute millions of laptops to poor children without any consideration about their security. If these Classmates are useful, children could get hurt when they are robbed of them. If they have XP-grade security, the children will own zombi machines and get the victims of ID theft. But in all the Classmate PR, I have not heard anythong about the children's security. I really hope I have just missed the crucial information. Rob, the security considerations are just as important for the XO. Besides the zombie issues, the XOs are as liable to be stolen from the kids as the Classmate, and even more, since they are allegedly going to carry the machines, instead of leaving them at their schools, as the Classmates. Rob, you are probably right that the XO has an advantage over Classmate on the technical level. So OLPC could easily use this advantage to prove its superiority by installing scientifically acceptable documentation methods in their pilot projects. Why are they so reluctant to do that? "Rob, the security considerations are just as important for the XO. Besides the zombie issues, the XOs are as liable to be stolen from the kids as the Classmate, and even more, since they are allegedly going to carry the machines, instead of leaving them at their schools, as the Classmates." No. The XOs will shutdown automatically when reported stolen, or when they don't contact the school server within several weeks. So they become useless pretty fast. The XOs safety and security has been tought through very far. I have no idea whether it played a role at all in the Classmate's design. I don't see any security or safety consideration with the Classmate. But maybe I just missed it. "So OLPC could easily use this advantage to prove its superiority by installing scientifically acceptable documentation methods in their pilot projects." Please, could you explain what you mean here. I don't know what "scientifically acceptable documentation methods" are, and they seem important. Troy: Thanks for such a fantastic display of Spanish to English translation skills, and also thank you for visiting my blog. I suppose when you said 'utter lunacy' you didn't mean it, right? After all, I am not the 'OLPC representative' (and don't get paid for showing the machine). all I am is an active citizen trying to support a fair cause. I'm doing as much as I can to make a sensible defence of the OLPC initiative, which unfortunately means I don't have all the possible answers to all the possible questions. Being said so, the point I was trying to make in my blog has to do with the contradiction between the bureaucratic demands for planning and the ethical dilemma rising in terms of securing access to ICT for kids ASAP. Winter: Actually the Classmate PC has a stronger anti-steal policy, and in general, it's heavily focused on the kids's security. Unfortunately the Intel guys are not very good at promoting their machines to the general public (although they are the best talking with governments and ministries of educations). I have a meeting on Monday afternoon with one of the guys in charge of that software so I'll have more news about that soon. Rob, it is a clumsy formulation for the same argument that troy as well as me have made several times. It means scientific proof of the effectiveness. And that such a proof could actually strengthen OLPC's position.